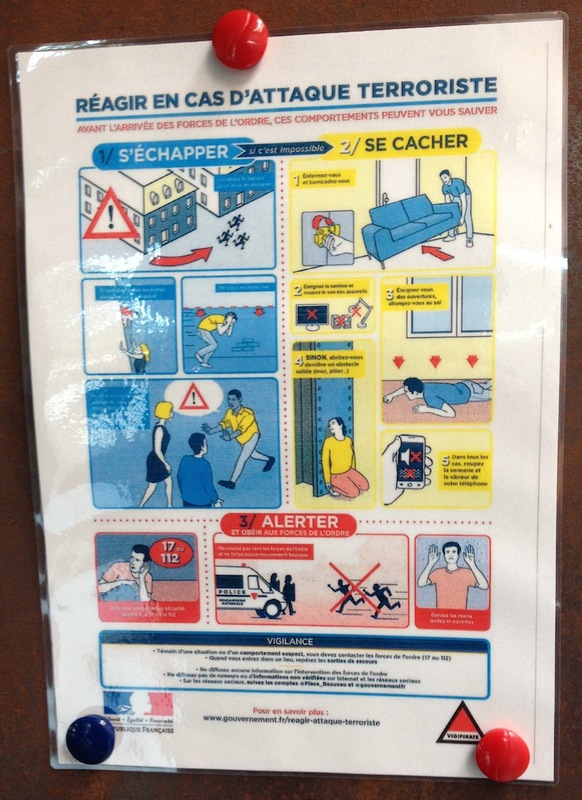 I saw this laminated warning notice about what to do in the event of a terrorist attack on the door of a museum in Rodez, on my recent holiday in France. Sensible advice, simply illustrated, and easily understandable even to me with my very poor French. The town of Rodez hosted the finish of Stage 14 of the Tour de France on Saturday. A lifetime ambition of being at such an event was however thwarted by having booked to fly home from the local airport at 1725 local time – so we missed it all. And it was one of the most dramatic stages so far, with Chris Froome taking back the yellow jersey from Fabio Aru after beating him up what the BBC called the ‘short but punchy finish.’ Very bad planning!